I am so excited to be a part of Debbie’s Home Tours!My name is Penny, and I blog over at Penny’s Vintage HomeThank you so much for inviting me Debbie! painted the drab brick a fresh white. He sprayed on approximately 45 gallons of paint to the house and studio. I have started to add a few touches of fall to our home. 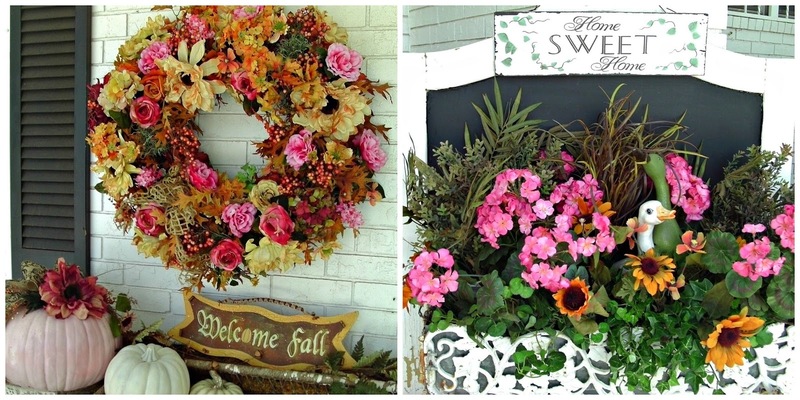 I love pink and use it generously even in my fall decor. We have finally got all the dark wood painted white in the family room…what a job! The family room pictured above was dark, dark paneling…it took 7 gallons of paint to cover all of that dark wood. We also replaced the beige carpet with wood flooring. The fireplace was originally black lava rock with no mantle. It has been painted cream and we have added a “free standing” mantle. The family room is the hub of our home.In the first photo, you can see how you enter it from the formal dining area.In the second photo, you can see how you enter it from the kitchen.And in the third photo, is a view from the sun room. All the cabinets in the kitchen were dark wood when we moved in and the flooring was blue indoor/outdoor carpet. I love cooking in this bright and sunny kitchen! I have a “Cupcake meets Silver” theme in the kitchen right now, but I change it pretty often. We have several places to sit down and enjoy a meal…. Photo 1 shows the little table for two in our kitchen where H and I can have breakfast or a cup of tea.The second photo is of the small eating area that is at the end of the family room.It will easily seat 4, or put a couple of leaves in and seat 6.The last photo is of the eating area in the sun room.H and I love to have our lunch here and look at the yard while we eat. You must think that all we do is eat…,lol……because this is the formal dining room.When all the leaves are in this vintage Duncan Phyfe table it will seat 10-12 easily, more if we squeeze in. Our home has three bedrooms that are still a work in progress. We plan to replace the carpet with wood flooring ……someday! The photo on the left is the main bath…it is decorated in a Pink Paris theme.Both baths have been updated with new flooring, sinks & faucets, counter tops and toilets.The photo on the right is the bath off the master bedroom. It is decorated in cream and aqua, with a Sea Side meets Shabby Chic theme. One of the first projects we did when we first moved here was to enclose the existing covered patio with six sets of French doors. With the warm winters here in New Mexico, we are able to use the sun room year round. We have painted all the cabinets white in the laundry room, replaced the indoor/outdoor carpet with tile, and added bead board and crown molding. I do my hair and make up at the desk in the laundry room.In our “built in the 60’s” home, the bathrooms are not very large, so I had to expand to the utility room! There are a couple of built in cabinets in the utility room…. I use this one to store all my linens . I love vintage linens and have quite a collection. I want to close my home tour with a few pictures of our back yard…. and front porch.Thank you so much for visiting our home…and thank you again Debbie for letting me be a part of your home tours. Thank you for sharing Penny’s Vintage Home. It is so charming! A real girlie girl home, for sure. I have followed Penny for some time and she has the cutest decor. The outside of her home is so fantastic and just screams helllllllo and welcome! Delightful, Penny….many thanks to you and Debbie for sharing your gorgeous home! Wow ! Thanks for the beautiful tour. Even the laundry room looks like a place I would want to be. Lovely! Penny your Home showed just beautifully! Love you have already added all the Fall Pumpkins to your Mantel, everything done to a “T” or should I say “P” for Penny! Penny what a beautiful home a great details. I love that wreath on the front of the house. The columns outside are my fav and I can’t believe how much paint you have gone through between the outside and your living room alone. Wow! Gorgeous! Tons of work, making all the difference. This home should be in a magazine! Thanks for sharing! I think that Penny and I are soul sisters! LOVE her fun home. 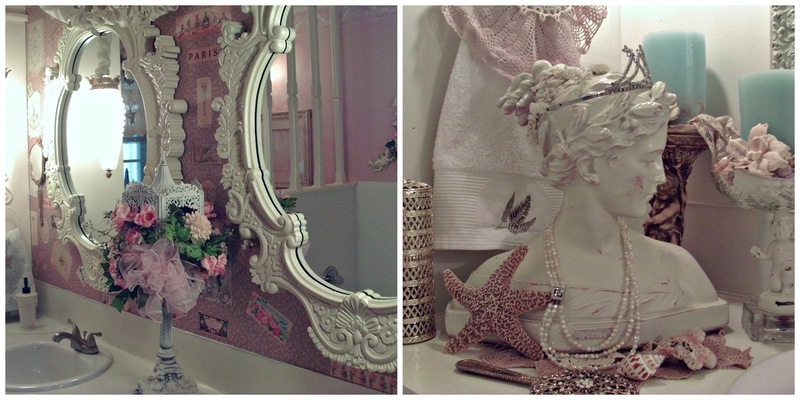 Thanks for sharing Penny’s adorable vintage cottage with us! Penny…you have done an extraordinary job with your home! I just love everything, especially your kitchen!! Every thing inside and out is so beautiful!! I will be by to visit your blog! Hey, Deb!! Thanks so much for featuring my good Bloggy friend, Penny’s, home!! Her and her sweet hubby have done a fantastic job! Love her style and creativity! Way to go , Penny!! Thank you for sharing Penny’s home. I love it! I have to go and tell her so…. Such a lovely and romantic home…so many beautiful details throughout and her yard and gardens are gorgeous. Thanks for another great home tour Debbie! Delightful and cutesy designs. When Penny said she loves pink, I never realized how true it is until I say the photos.